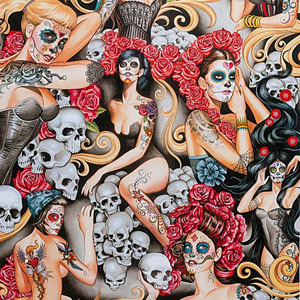 Day of the dead pin up women with red roses and skulls on smoke charcoal background. Each "girl" is 6 to 12 inches tall with a repeat every 24 inches. New, straight from the bolt, 44/45 inches wide, 100% high quality quilter's cotton. From the Las Elegates fabric collection from Alexander Henry Fabrics.